Ask me what kind of photography I do and in my elevator pitch I’ll tell you it’s corporate photography for business websites, brochures and press releases, specialising in people, places and products. You might note that the word “products” comes at the end of that sentence and that’s because I’m primarily a “people” photographer, but I do occasionally find myself trying to find the best angle on an inanimate object and over the years I’ve done quite a few of those too. What has held me back a little has been the lack of space to shoot larger pieces. Even small items require a surprising amount of space for all the equipment you need to do them properly. Last week though I was able to try out a great new space in the building where my office is based. It’s an event space anyone can hire, but it happens to be perfect for a decent sized studio. It’s also large enough for me to do full-length portraits should the need arise. Last week’s shoot (large metal racks) was a good test of the space and it worked extremely well. 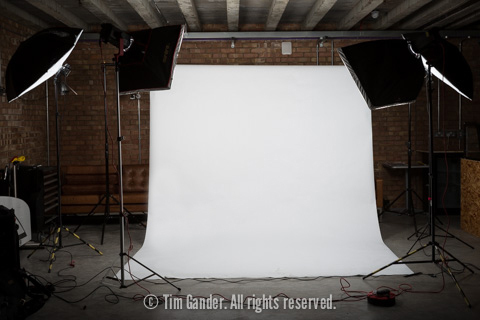 The big advantage of this is that I now have access to a space which can accommodate all the backdrops, lighting and paraphernalia of a photographic studio without the constant overhead cost of running a full-time studio; a cost which I’ve seen crush a few photographers. I’m very pleased that I don’t have to be crushed! If you need either people or products photographed in a comfortable, flexible space, just contact me and we’ll talk it over.